Improvised music, comedy, scenes, the works. If you've seen "Whose Line Is It Anyway" you have an idea of what kind of hilarious, energetic comedy that team improv can be. If you come to our show, you will laugh. If you don't, there's no one who can help you. The Society are 12 time iO West Cage Match Champions! What to Expect:At The Society Comedy Troupe, a cast of professional actors and comedians will take you on a comedy adventure that is never the same twice. Most shows begin with a short warm-up from one of our players to explain the show and get the audience ready to enjoy. Then our Players take the stage, and the spontaneity begins. Because we get suggestions for scenes and seek input from the audience, you can, if you choose, directly affect the show. Usually we do shorter improv games or scenes at the beginning of the show, and then start a long-form play or musical for the second half. However, because we’re making everything up, that can change too! 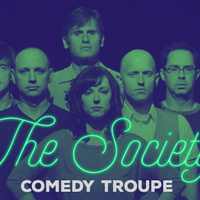 For more information about The Society Comedy Troupe, visit: societycomedy.com.